Add another dimension to your artwork with this dual-tipped Tombow Fudenosuke Brush Pen. Featuring black ink on one end, and grey ink on the other, this pen is perfect for both lettering and drawing. The firm, yet flexible brush tips can create extra-fine, fine, or medium strokes by a simple change in pressure. An added perk to this unique tool – it’s waterproof when dry, making it an excellent companion to your new watercolor pencil. Deliver a delicate, yet vivid touch to your paper with the Caran d’Ache Supracolor Soft Aquarelle Pencil. This water-soluble colored pencil easily meets the needs of any artist, thanks to its excellent coverage and lightfastness. The brilliant color remains intense wet or dry, giving you unlimited options for blending techniques. Layer up this month with Daler-Rowney FW Acrylic Artists’ Ink! This acrylic-based, water-resistant ink is highly pigmented for creating multiple color layers on top of your art. Dilute the ink with water to achieve an intense watercolor effect, or use a dry brush to create textured strokes. Different types of mediums require different types of paintbrushes, and a good acrylic brush should hold color without losing its shape. The Robert Simmons Short Handle Acrylic Paintbrush features synthetic filaments chosen to provide both the softness and control you need to get the most out your acrylic ink. Try out your new art supplies with three bonus sheets of cold press L’Aquarelle Canson Heritage Watercolor Paper. This heavy (300gsm), 100% cotton paper is strong and absorbent, offering excellent color laydown and ultra-sharp brush strokes. Experience precise control as color flows smoothly from your brush to paper. If you like this paper, full-sized pads will be available for purchase in the ArtSnacks Shop! We love the convenience of having all our favorite art supplies with us on the go! Tote this limited edition ArtSnacks Pencil Case around town, proudly showing off your ArtSnacks pride. Custom-made from durable nylon, this case comes in ArtSnacks teal (a color exclusive to our customers) and will never be available anywhere else! Get ready to use one of the highest quality alcohol-based markers around. The extremely versatile Copic Ciao Double Ended Marker has two durable nibs – super brush on one end, and medium broad chisel on the other – making it ideal for all styles of art, design, and illustration. Two standard perks of this Copic marker: it’s refillable and the nibs are replaceable. That’s right – we’re including two Copic products this month! The Copic Multiliner features a sturdy nib and smooth ink flow, which results in clean, precise drawings. The archival, pigment-based ink is waterproof and Copic-proof when dry, meaning it will not bleed when colored over with your new Copic Ciao marker. To avoid smearing, we recommend using this pen before applying colored pencils. Lay down some major color with Lyra Color Giants. These oversized, highly pigmented colored pencils are perfect for covering large areas in your artwork. Their extra-thick, break-resistant cores last three times longer than regular colored pencils. We’ve packed your box with two different colors, so you can fully experience their brilliant, lightfast quality. Paint like a French Impressionist with Sennelier French Artists’ Watercolors. These rich watercolors evoke the timeless beauty and vibrancy of Southern France. Formulated with honey from the Alps, they boast incom- parable brilliance and luminosity. The triple- milled pigments have been produced in the same way for more than a century, giving these watercolors exceptional intensity and smoothness. High-quality watercolor paints deserve a high-quality paintbrush! Don’t be fooled by its adorable, small size – the Raphaël Mini Precision Brush (flat size 2) is a state of the art, synthetic watercolor brush. It mimics the exact performance of sable hair, creating the most accurate brush strokes of any synthetic brush on the market. The bristles hold pigment well, while also retaining their shape stroke after stroke. Lightly sketch your outlines before painting with this 2H Faber-Castell Goldfaber Sketching Pencil. Made from finely ground graphite and clay, the lead is crafted for a smooth, consistent laydown. You won’t need to constantly sharpen this pencil either – its core is fully bonded with the wood for extreme durability and break-resistance. Micron lovers, rejoice! Sakura has introduced the Pigma Micron PN, a new pen suited for everyday writing and drawing. Featuring the same quality Pigma Ink performance, its durable plastic nib (PN) produces consistent fine or medium lines. The archival ink is also quick-drying and waterproof, making this pen the perfect companion to your new watercolors. Try out your new watercolors on a bonus sheet of 140 lb (300 gsm) Fabriano Artistico Watercolor Paper. This 100% cotton paper is sturdy and durable, and can withstand heavy layering and erasing. Everyone’s favorite paint marker now comes in brush form! The PCF-350 Brush Tip Paint Marker by Uni-Posca contains opaque, water-based pigment ink that writes on all surface types. This odorless ink dries quickly and will not bleed through paper. To use, shake the marker gently and pump the push button on its end to prime the ink into the brush nib. Wet your palette this month with two Marabu Graphix Aqua Pens. These felt tip watercolor pens are double-ended, featuring a fine contour tip and a larger brush tip. The high quality, water-based pigment ink delivers brilliant color and works best on watercolor paper. After applying color, use a wet brush to spread it out. Start the new year off with an amazing new pen! The Tombow Fudenosuke Soft Tip Brush Pen is great for both lettering and drawing. Create controlled, precise strokes with the flexible brush tip. By changing the pressure, you can produce a variety of lines. The water-based, pigmented black ink is ideal for adding details and finishing touches to your work. Grab this hefty pencil for some powerful drawing! The Sakura SumoGrip Mechanical Pencil is designed for ultimate comfort and function, featuring a triangular grip and jumbo twist eraser. Its oversized barrel allows for a relaxed grip, making lengthy sketching sessions enjoyable. Filled with 0.7mm lead, this tool produces crisp, medium lines of consistent density. We specially designed this pack of Bruynzeel Expression Colored Pencils just for ArtSnackers! Imported from Holland, these cedar-encased pencils are packed with quality pigments. Barely any pressure is needed to achieve bright color, thanks to this pencil’s strong, thick 3.3mm core. The vivid hues will pop off your page! Everything you touch will turn to gold with the Caran d’Ache Metallic Gold Fibralo Marker. Opaque, metallic ink flows beautifully from this marker’s fiber tip and is vibrant on paper. Don’t worry about leaving the cap off – this marker can go seven days uncapped without drying out! 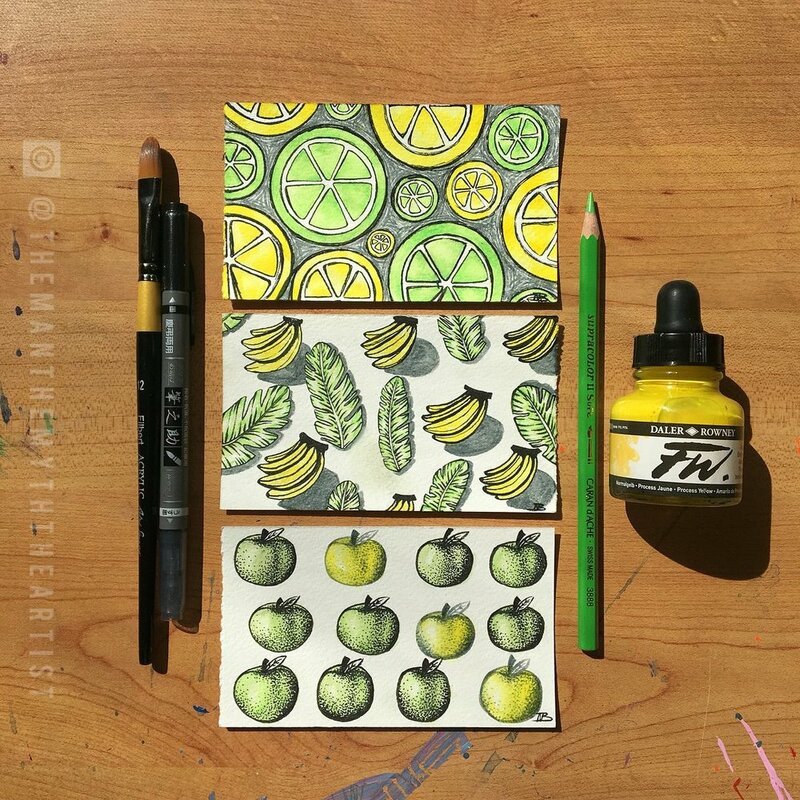 Add some flair to your work by layering the ink over colored pencils. In this month’s box, we’ve included the K-32 Acrylic Paint Marker – a chisel-tipped marker filled with water-based, permanent acrylic paint. This ultra-smooth, opaque paint maintains its vibrant color on light or dark surfaces. To use, shake well until thoroughly mixed, remove the cap, and press the nib down several times until saturated. Get down to details with the Pentel Slicci Gel Pen. This pen features an extra-fine, 0.25mm metal tip perfect for drawing on a smaller scale. Its ultra-smooth, gel ink is fast drying and comes in a variety of brilliant colors. Made from 87% recycled plastic, the Slicci is part of the Pentel Recycology product line. This month, we’ve included a sample pad of Grumbacher Mixed Media Paper for you to try out your new supplies. The medium tooth texture of this heavy (185 GSM), white drawing paper is excellent for dry media and light washes of wet media. Your colored pencils and markers will stand out beautifully on this paper! For their 20th anniversary, Molotow has introduced the festive Liquid Chrome Marker – a celebration in a pen! With this unique marker, create high-gloss, mirror effects on nonporous paper, or metallic effects on regular, absorbent paper. The alcohol-based ink is highly opaque and permanent, which makes it perfect for adding shimmering, final touches to your work. This pen is also refillable, so don’t worry about using it too much! We always appreciate a valuable blending tool. The Amsterdam Titanium White Acrylic Marker lets you work quickly and directly on a variety of surfaces. It features water-based, pigmented white ink that can perfectly blend your two new Tombow TwinTone Markers together. With the comfortable Caran d’Ache Grafwood Pencil, sketching has never been more enjoyable. Featuring a creamy, softcore and hexagonal body, no wonder this is the most premium graphite pencil offered by Caran d’Ache! This tool comes in a variety of grades, and its varnish color represents the hardness and depth of the graphite – which one did you get? 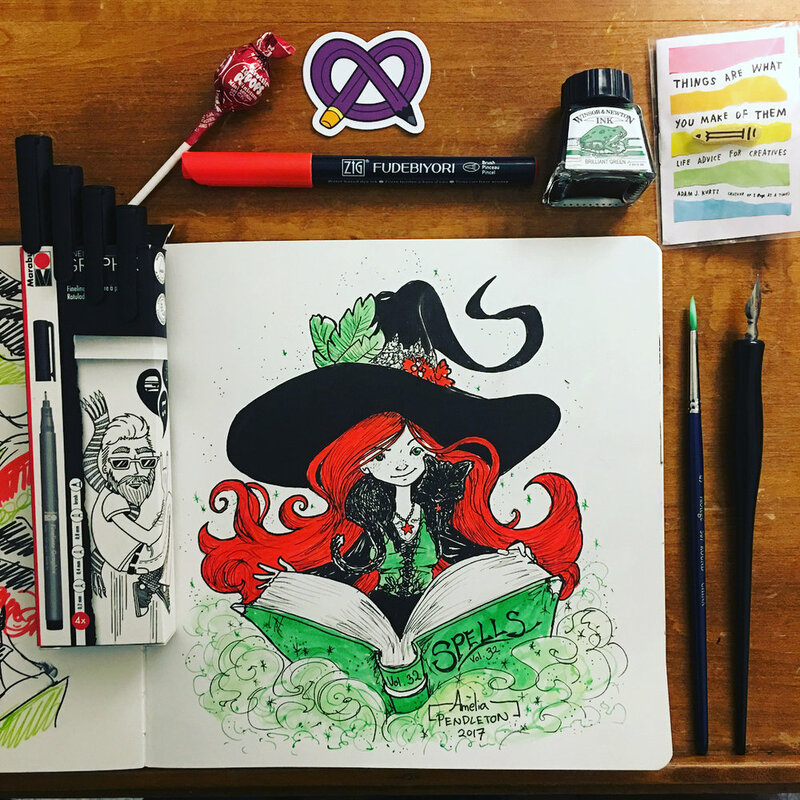 Double your creativity this month with two Tombow TwinTone Dual-Tip Markers. These water-based markers have durable fiber tips on both ends – a broad bullet tip, and an extra-fine tip. Their ink is saturated with color that pops on your page and can also be blended out using water. Clip these charming markers onto your sketchbook cover for spontaneous doodling or lettering! be careful not to smudge your work as you go–markers and paint will take several minutes to dry. Designed with the professional in mind, the Alvin Draft-Matic Mechanical Pencil delivers comfort and control. Featuring stainless steel finger grips, a rotating window to display lead type, and a built-in eraser under the cap, this pencil is the ultimate drawing tool! We’re featuring two different lead sizes this month – 0.7mm and 0.9mm. Which one did you get? Don’t let little mistakes get you down! Fix them instantly with the MOO Professional Artist Eraser. This handy tool is truly unique – rather than leaving dust behind like other erasers, the MOO’s residue clumps together into thick strands for quick and easy cleanup. Its soft, yet dense body will not damage your paper, even with excessive rubbing. Now you can focus more on drawing and spend less time switching between erasers! Summer may be winding down, but Amsterdam Acrylic Ink will keep your days bright all year round! This highly pigmented ink is extremely versatile – it can be thickly applied like acrylic paint, or diluted with water to achieve watercolor effects. Shake well before using, then feel free to work directly out of the bottle with your brush, or use the convenient ink dropper. Layering is effortless with this fast-drying ink, so get creative and explore some new techniques! Paint in the lap of luxury with the Princeton Velvetouch Long Round Brush. It's silky, soft-finish wood handle complements the excellent performance of its synthetic fibers. Seven years of research and development went into creating these filaments meant to outperform natural hair. This brush is the ultimate mixed media tool and can be used with various mediums. Go ahead and try it out with your Amsterdam Acrylic Ink! Customize the way you draw with the ZIG Cocoiro Letter Pen. Derived from the Japanese words “ kokoro,” meaning “heart,” and “iro,” meaning “color,” this pen was made for you to choose each part separately to match your mood. From the pen body’s color to the nib style, mix and match a variety of features to express your unique creativity. This month, we’ve included an extra fine brush tip refill for your new pen body – perfect for all your inking needs. Whether you’re sketching or writing, you’ll reach for the Faber- Castell Ecco Pigment Fibre-Tip Pen over and over again. This reliable fine liner pen features a sturdy, metal-clad 0.7mm nib and a comfortable grip. Made from unused automobile plastic, this pen is highly recyclable. Since its pigmented ink is lightfast and waterproof, you can lay ink or watercolor on top of your sketched lines carefree! Flex your creative muscles with the Pentel Duopoint Flex Double- Ended Brush. This handy pen is actually two brushes in one, featuring a unique, springy brush tip on one end, and an ultra-fine, flexible nib on the other. It's water-based ink dries quickly and can produce transparent watercolor effects. The versatility of this brush pen makes it perfect for beginning artists. Make a splash in your artwork with Caran d’Ache Museum Aquarelle Pencils. These 100% water-soluble pencils remain extremely vibrant dry or wet, thanks to their high pigment density and lightfastness. When brushed with water, the pencil marks melt onto your paper and intensify in color. The soft, buttery pigments are super blendable, so experiment with your two new colors to create different hues and patterns. A successful sketch starts with a good graphite pencil. The HB Graphic Drawing Pencil from Derwent is smooth and strong to the core, which means you’ll experience fewer broken points. Its hexagonal body is easy to hold, making it the ideal choice for long working sessions. We’re flipping over the Derwent 2-in-1 Eraser/Sharpener. This dynamic duo features a pencil sharpener with a rotating barrel for collecting shavings and an eraser that offers clean and smudge-free erasing. The sharpener separates easily from the canister to empty pencil shavings, and the eraser comes with a protective cover.Talk about convenience!